What is your go to snack while watching the madness? For some it is chili. 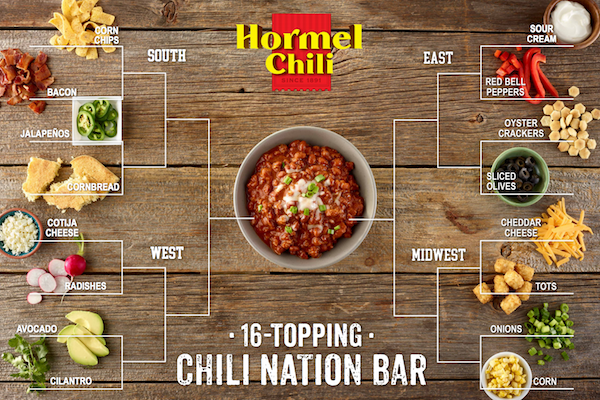 Hormel would like to introduce the 16-Topping Chili Nation Bar – paying homage to one of the most-watched portions of the big tournament; this chili bar is sure to please fans from all over the country with specific ingredients tied to each region. Check out last year’s chili purchasing stats from March of 2017. 1. Last year, over 8 million pounds of HORMEL Chili was purchased during March in America! Print article This entry was posted by Art Eddy III on March 16, 2018 at 11:06 am, and is filed under Uncategorized. Follow any responses to this post through RSS 2.0. Both comments and pings are currently closed.